You had to figure when a complete political novice like Donald Trump won the Republican nomination and then the presidency that the press would be fascinated (in a sick kind of way) with his administration, but the reporting that’s resulted from Trump’s first twelve weeks of service has been nothing short of extraordinary. Forget all of the back-and-forth over last month’s healthcare debate and the nomination and confirmation of now Justice Neil Gorsuch. Dismiss all the media’s wailing over supposed Trump slights to the intelligence community or the writers’ preoccupation with all things Russia. No, what’s been truly remarkable about the media in the age of Trump is its soap opera-like obsession with the people who work for and with Trump. Simply put, they’ve tried unsuccessfully to turn the brilliant and accomplished Kellyanne Conway into an overly-ambitious blonde airhead, the equally brilliant and trailblazing Steve Bannon into a cunning and dark grim reaper and Trump’s family into a gaggle of nepotistic power-seekers. But all of the negativity surrounding those figures is nothing compared to what journalists have saved up for Press Secretary Sean Spicer. Josh Dawsey of Politico reports, “White House press secretary Sean Spicer had to do something Tuesday night his boss deeply dislikes: He apologized. Dawsey’s article goes through all the reasons why Spicer has supposedly become a lightning rod for controversy in Trump’s administration, and once again surmises the president’s top press relations man is in trouble with the big boss for his inability to control the narrative the media is putting out. Like it’s Spicer’s fault the liberal Saturday Night Live chose actress Melissa McCarthy to dress up in a ridiculously oversized suit and try to generate laughs through badgering pretend reporters. The truth is Spicer’s is a thankless job in any Republican administration, much less Trump’s. For the individual charged with the task of going out each day and presenting the administration’s side of the story, it’s a losing proposition from the moment he or she steps up to the microphone – because the press doesn’t want to hear it. If the journalists want to talk about Russia or Trump’s tax returns or some false charges about Neil Gorsuch ruling in favor of wealthy donors, those are the questions they’re going to ask. Spicer can only take what’s given him and try to answer questions which in many cases aren’t reasonable in the first place. Substitute the word “media” for “Terminator”. It works. That’s it. 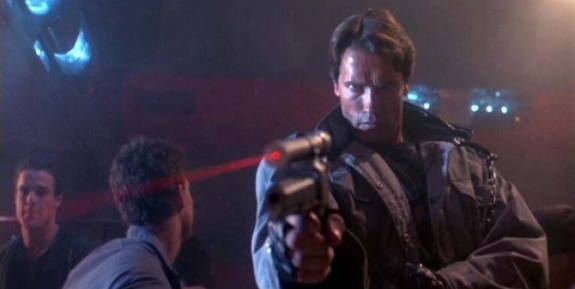 Journalists are just like robotic “Terminators” (Arnold Schwarzenegger should be proud). If that quote doesn’t describe today’s media, I’m not sure what would. The media is out to bring down the Trump administration and it can’t be bargained with or reasoned with. And the perpetually hungry for controversy reporters will not stop…ever. In saying so, is Dawsey presenting a commentary or a news story? Politico certainly blurs the lines but so do the so-called “mainstream” outlets such as the Washington Post and the New York Times, CNN and the big networks. Their stories are loaded with vivid and slanted language about the “news” from the Trump administration. As the most visible representative of the Trump administration (at least the one who MUST respond to questions), Spicer is the de facto kicking boy of the journalism profession. Do you ever recall anyone from the Obama administration being asked to apologize for anything? Should Obama have said he was sorry for saying the police “acted stupidly?” Should Susan Rice have apologized for blaming four American deaths in Benghazi on an obscure video instead of obvious terrorism? Should Hillary Clinton have shown contrition for compromising national security with her email server and then lying about it? Should Eric Holder have said he was sorry for devising the failed Fast and Furious operation that led directly to the death of Border Patrol Officer Brian Terry? Should Loretta Lynch have asked for forgiveness for meeting with Bill Clinton last June in the final days of her criminal investigation into the Democrat presidential nominee? For any media outlet to make hay over apologies – or the lack thereof – is the height of hypocrisy because the coverage is already so one-sided in favor of liberal Democrats. If anyone should apologize, it’s the Democrats. And if the media members want to throw in a little regret of their own, it wouldn’t be an unwelcome thing. As for Spicer’s Hitler comparison, it was factually incorrect. Hitler used plenty of chemicals to do plenty of killing in World War II. Everyone with even a basic knowledge of the Holocaust knows how the genocide was carried out. But the media’s fixation on Spicer’s statements underscores their general campaign to label the Trump administration as racially and religiously insensitive, especially to Muslims and Jews. Many liberals blamed the recent spike in violence against Jewish cemeteries on the Trump team’s failure to condemn anti-Semitic rhetoric by hate groups in real-time. It’s a hypocritical double-standard considering they didn’t seem to have much problem with Obama’s failure to quickly denounce anti-police rioters in Ferguson (Missouri) and Baltimore (Maryland). Sean Spicer’s unwise comment doesn’t make him a Holocaust denier any more than it equates to the Trump administration being racist or bigoted. Spicer has an impossible job in trying to assuage a news media that despises Trump like none other. It’s an unattainable goal. Should Democrats really be jubilant over losing a Kansas special election for a House seat? Try telling that to the giddy Democrats who are claiming victory after coming close to winning a special election to fill the seat of Mike Pompeo, the former Kansas congressman tabbed by Trump to head the CIA in his administration. Democrats “only” lost by eight points in Tuesday’s voting, which has them seeing nothing but positives and future successes because of it. W. James Antle III of the Washington Examiner wrote, “Democrat James Thompson came within 10 points of Republican Kansas State Treasurer Ron Estes in the state's safely GOP 4th congressional district. “President Trump carried the district by 27 points in November. Rep. Mike Pompeo, who resigned earlier this year to serve as director of the CIA, won it by 31 points. It’s true. Kansas’s fourth district, statistically speaking, is one of the reddest in the country. It’s a House seat Republicans likely don’t pay much attention to, figuring it’s a lock for the GOP in the same way a minority heavy inner-city New Orleans district or a Massachusetts senate seat should be a shoe-in for Democrats. The only problem for Democrats is they didn’t win anything. They lost. Ron Estes will soon become Congressman Ron Estes and no one will think about his modest margin of victory after a couple more weeks. As children we used to say “close only counts in horseshoes and hand grenades.” The same goes for politics, because if you have more votes than your closest competitor in a House district election, you win. Period. As referred to above, Democrats lost a heavily Democrat New Orleans area seat to Republican Joseph Cao in a run-off election in December, 2008 – a month after Obama won the presidency. That’s right. The Republicans won. They didn’t crow about coming close. They took the big prize. Cao subsequently became the mushiest of all “moderate” Republicans but he did end up voting no on Obamacare, making GOP opposition to the law unanimous. In other words, Cao was perhaps only slightly better than a Democrat would be but showed some political moxie by casting a vote that would virtually guarantee a loss in his first reelection race (Cao did lose in November of 2010). The GOP also put a fledgling Scott Brown over the top in a special election to serve the rest of the late Senator Ted Kennedy’s term in early 2010. That election was in heavily Democrat dominated Massachusetts. Again, Brown won, he didn’t just come within eight points. Brown subsequently lost to Elizabeth “Pocahontas” Warren in 2012 by “only” seven points. But a loss is a loss, right? I bring up these past races to prove a point – a close loss is still a loss no matter if the Democrats over-performed their usual numbers by 20 points. So what? Beyond a close call, the Kansas 4th district seat remains in Republican hands today. With Democrats trying to read some special significance into a close defeat, they’re really just continuing the trend of consistently wrong doomsday predictions that have followed Donald Trump ever since he became the Republican frontrunner in the summer of 2015. It isn’t all that much different than pundits saying Hillary Clinton would have the upper hand in running against him. Or predicting Democrat candidates for the House and Senate would prevail last November because Trump would act as a drag on any Republican that got too close to him. It’s all nonsense. There are other factors in Kansas that likely contributed to the Republicans’ underperformance there. Or, maybe voters are doing what they sometimes do – reject the party in power. Who knows? We’ll find out soon enough whether it’s a trend, since there are five more special elections to come through June. For now, the Democrats are losers. Again. Let them go weep in their organic chai tea. One of the very first actions the newly sworn-in Donald Trump took as president was to impose a hiring freeze for non-military federal employees. Conservatives hailed the move as a solid initial step in the long and arduous process of paring down the size of the federal leviathan. Unfortunately, the freeze has now been lifted. Reaction is still coming in. Alexis Simendinger of Real Clear Politics wrote, “The January prohibition on new hiring is replaced Wednesday with what Office of Management and Budget Direct Mick Mulvaney called a ‘smarter plan’ that the administration hopes will complement Trump’s budget priorities and lead to a redrawing of the executive branch from the ground up. At first glance it was a huge disappointment to see the Trump administration giving up on the hiring freeze. It still is, but knowing the conservative Freedom Caucus-founding Mulvaney is involved with this new project not only gives it credibility, it also gives it a much greater likelihood of success. Other reports on the lifting of the hiring freeze indicated it was done partially because of necessity, that social security and veterans benefits administrators were feeling the pinch. That certainly could be and is likely true, but the move was originally meant as a starting point for eliminating portions of the bureaucracy that exist simply because some politician somewhere wanted it that way. Congress will need to take a major role in advancing any kind of federal departmental reform. It’s a monumental task that will require a great deal of cooperation and political will. After the debacle over healthcare I have my doubts that such strong fortitude exists. Will Republicans stick to their government cutting guns after the liberals and media start squawking about people starving and dying because the government is being cut? Hopefully President Trump will continue to speak out about the issue because the federal budget requires it, but also because the government is so large it intrudes on Americans’ private lives and rights. Somewhere in there is a balance. Let’s see if they can find it.